Inflation. It's a term used by economists and politicians, usually to justify their own shortcomings. I'm neither an economist nor a politician, but today's post is about inflation - well, indirectly anyway. 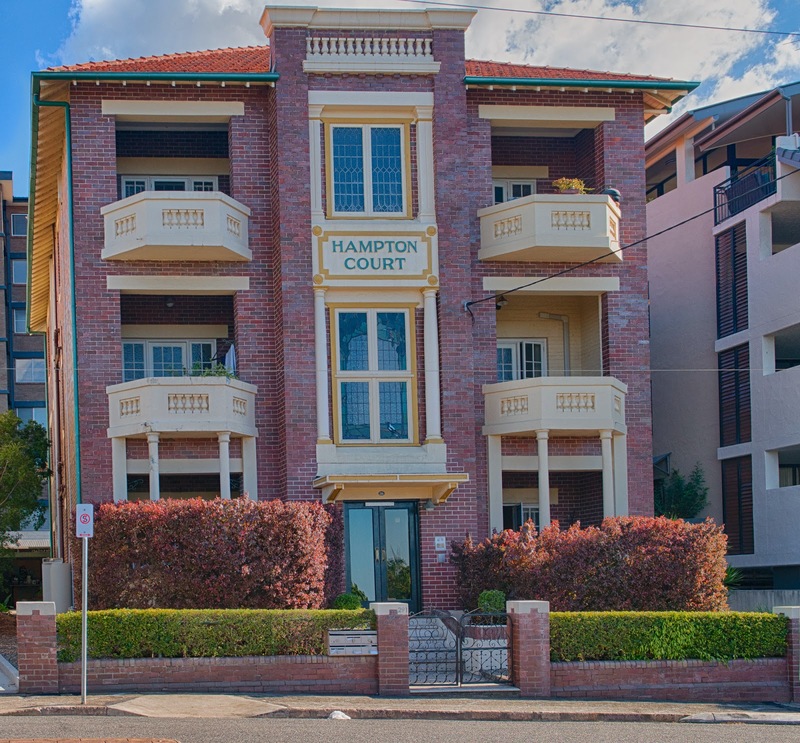 The photograph you are looking at below is of a block of 6 flats in New Farm - Hampton Court. These flats were erected around 1927 for dentist and investor William Danaher. Architects Hall and Prentice, who were in demand after designing Brisbane's City Hall, came up with this attractive building that is described as "Interwar Functionalist and Georgian Revival" in the BCC Heritage List and "Art Deco" by real estate agents. The Courier-Mail carried this article about the flats in March 1949. Yes, that's right! £10,000 for the whole block of flats! The block was turned in at auction for failing to reach reserve and the selling agent valued the building at more like £15,000. Here is a photograph of the building from 1989. I must admit that the estimated value of the building 65 years ago was surprising. I got to wondering about today's value, so I asked the Reserve Bank of Australia to help me. (Not really - I just used their on-line inflation calculator.) This is what it told me. Allowing for inflation, the agent's valuation of the block of flats - £15,000 in 1949 - was now equivalent to $771,428.57. A significant increase. But don't forget we are talking about the supposed value of all six flats in this attractive, close to the city suburb. I checked the real estate pages. The last sale I could find in this block was for a top-floor flat that sold for $620,000 in October 2010. One flat. Given that October 2010 is three and a half years ago, it is possible that one flat could now command the same relative price as the whole block did back in 1949. On that basis, and assuming that the flats on the higher floors would attract higher prices than those lower down, the price of the whole block would be something in excess of $4 million. Of course, the RBA Inflation Calculator demonstrates how inflation affects a "basket of goods", not real estate. But it does get me thinking about current real estate prices. Are they over-valued? Oh, for the love of time travel! Sorry about your mum. I hope the family copes with dignity. I have never heard of "Interwar Functionalist and Georgian Revival", but I also wouldn't know what else to use. "Deco" it isn't. "Federation" would be acceptable, had it been built in the 1895-1920 era. With added columns. Were the red bricks and cream stucco typical for this part of Brisbane? The central windows are gorgeous.